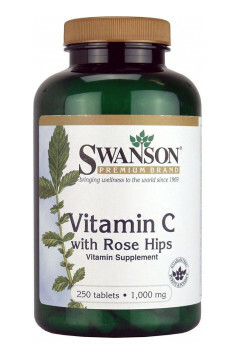 Swanson Vitamin C with Rose Hips is a popular dietary supplement with vitamin C in the form of L-ascorbic acid and dog-rose seed extract. L-ascorbic acid (vitamin C) is a vitamin necessary for live organisms to function properly. It takes part in tyrosine transformations and the synthesis of adrenal hormones. Its level regulates the number of lymphocytes in the blood, on which the functioning of the immune system is based. Moreover, vitamin C exhibits protective properties against many toxic substances: lead, carbon disulphide, aniline, etc. It is a great antioxidant, it protects the DNA, proteins and fats from oxidation. It is necessary for the right course of phagocytosis (absorbing pathogens by lymphocytes). With a high concentration of vitamin C in the organism, the liver is able to create maximum reserves of glycogen and improve its own detoxifying properties. Another supportive function of vitamin C is its active participation in the synthesis of collagen, which is responsible for skin firmness and flexibility (its deficiency results in wrinkles, stretch marks). For ascorbic acid to be absorbed, bioflavonoids and other natural substances are necessary. Pure L-ascorbic acid is an extracted product which is only a part of natural vitamin C. For that reason, it is good to administer it together with other natural products containing the above-listed compounds. An example of products rich in vitamin C and bioflavonoids is dog-rose. Dog-rose is a common shrub species. It occurs all over Europe, in warm and temperate areas. It can be found on forest edges, near roads and in bushes. It became applicable in supplementing thanks to its record amount of vitamin C. It also contains vitamins A, B1, B2, E, K, as well as folic acid, carotenoids, flavonoids and organic acids. Flavonoids play and important role in this case, as they significantly increase vitamin C’s absorbability in the organism, thanks to which we are able to quickly fight inflammations appearing during illnesses, after heavy exercise or excessive stress. Dog-rose is used the most frequently in treating hypertension, heart and liver diseases. To sum up, thanks to the great amount of vitamin C and rose hip extract, Swanson Vitamin C With Rose Hips is able to supplement our need for such an important component of the organism. Thanks to flavonoids, the product is valued for its high absorbability. It is recommended for every person who is unable to provide the sufficient amount of vitamin C on their own. It is a perfect solution for accelerating regeneration, improving the functioning of the liver and the immune system, reducing inflammations caused by a sickness or stress (stress uses up 90-95% of vitamin C in the organism). In research conducted by the Dr. Rath Research Institute in California, it was demonstrated that the preventive dosage for a healthy person is minimum 600mg. Vitamin C with Rose Hips 1000mg 250 tab. Take one talbet per day with water. Timed-release gradually over 6 to 8 hours. Vitamin C is soluble in water, therefore it is so important to wash down the capsules with plenty of water. Additionally, its assimilability will be increased when applied with natural vitamin C carriers. The recommended daily use of this vitamin should range from 100 to 200 mg and it is usually provided with a diet. In case of diseases or infections we need to support our immune system and take higher doses – it has been proven that the dose of 2 g/day (2 tablets) may decrease the symptoms of the cold or shorten its duration. However, in case of general health prophylaxis, using 1 tablet a day is enough. SWANSON is a well known company operating since 1969, which offers a wide selection of diet and nutritional supplements. Among their products are antioxidants, amino acid supplements, products improving immunity, probiotics, minerals and vitamins. At SWANSON you can also purchase of supplements enhancing your cardiovascular stamina, urinary, nervous and digestive systems. The offer includes products designed specifically for women or men, as well as supplements helping to loose weight. Stearic acid, magnesium stearate, silica, food glaze, hydroxypropyl cellulose, hydroxypropyl methylcellulose, magnesium silicate. Vitamin E in a convenient, liquid form. Effective cellular protection from oxidative stress.